"Individual pot pies that taste like pizza! The recipe is great to follow as is, or get creative and add your own favorite toppings! A great dish for kids and adults! This can be accompanied with a salad." 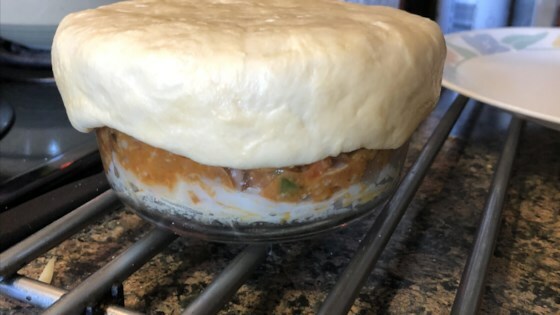 A pot pie loaded with pizza toppings! I selected 3 (hot, mild, and Mediterranean) flavors from the deli counter at our grocery store. This combination adds great flavor, eliminating the need for any seasoning. If you like it spicy, add in crushed pepper or other hot sauce like Frank's® Red Hot! For healthier options, switch the sausage with ground turkey or lean chicken. You will need to add seasoning, such as garlic salt, Italian seasoning, and a hot sauce or crushed pepper to get a more flavorful dish. Omit the cheese and use reduced-fat crescent rolls. This was the first recipe I tried from Allrecipes that I really didn't like. Perhaps if the crust was different....sorry, I just didn't care for this. LOVED IT!!! Great new way to make individual pizzas for a very picky family!! easy to make! our family loved loved loved it!